Released February 16, 1940 (Feature). 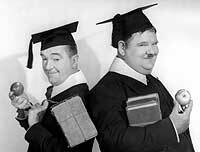 After thwarting a bank robbery, the boys are rewarded with an education at Oxford. When Stan gets hit on the head, he becomes the brilliant Lord Paddington--an Oxford scholar of years passed.